Southern Africa is well known for its huge variety of animal and bird species, with 922 recorded bird species, of which 525 have been recorded at St Lucia and in the iSimangaliso Wetlands Park. The large variety in different habitats within the Wetlands Park and the surrounding areas of Zululand and Maputaland results in huge species diversity, not only in bird species, but also reptiles, mammals, insects, plants and marine organisms. This makes St Lucia bird watching very interesting and productive, with birds ranging from Albatross, petrels and terns to wetlands species such as the Purple Gallinule, African and Lesser Jacana, crakes and herons including the Goliath Heron. Forest species include twin spots, toracos, hornbills and Narina Trogon. Lake St Lucia is home to thousands of White Pelicans and Pink Backed Pelicans and a myriad of waders including the Saddle-billed Stork, Greenshank, Whimbrel, Avocets and Black-winged Stilts. In the grassland areas there are Secretary Birds, Southern Banded Snake Eagle, Black Chested Snake Eagle, Martial Eagles and smaller species such as the Collared Pratincole. 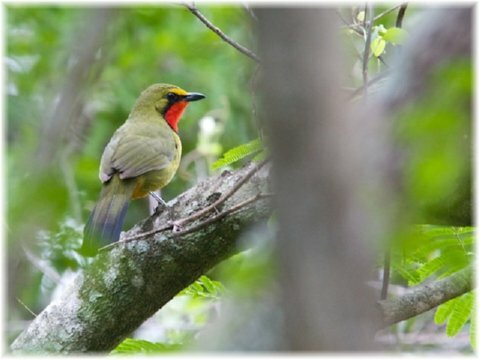 Visit the best birdwatching spots near St Lucia and in the surrounding Zululand and Maputaland regions, including the iSimangaliso Wetlands Park (formerly known as the St Lucia Wetlands Park) and Lake St Lucia, Kosi Bay and the Kosi Bay Lake System, home to the Palmnut Vulture, Tembe Elephant Park, the Muzi Pans, Mkuze Game Reserve, Lake Jozini, and the Hluhluwe-iMfolozi Park. Other than birding, you will also have the opportunity to swim with wild dolphins, view nesting turtles (November to March), view Africa's animals, large and small. After spending the night in the village of St Lucia Estuary, birdwatching begins early when we enter the iSimangaliso Wetlands Park, World Heritage site and Ramsar site. Birding, photography, game viewing and a visit to the beach are some of the activities today. Lunch consists of a barbeque just off the beach. There are plenty of berries in the forest for vegetarians (please let us know in advance if you have any special dietary requirements). We return to St Lucia in the early afternoon to do a birding cruise on the St Lucia estuary. The boat has refreshments, hard and soft, and is a good opportunity to sit back, relax and enjoy the scenery, wildlife and birds of the St Lucia area. Accommodation - St Lucia - Lodge. Meals included: Breakfast and Lunch. Dinner at a restaurant in St Lucia. Isimangaliso Wetlands Park entry fees included. Depart from St Lucia at 05h00 to arrive at the Hluhluwe-iMfolozi Park at 06h00 to catch the early morning bird and animal activity. Hluhluwe-iMfolozi has 400 recorded bird species, from the huge Lappet-faced vulture to the tiny waxbills, firefinches and sunbirds. 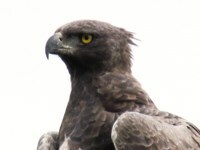 The Hluhluwe-iMfolozi Park has healthy raptor populations and is a great spot to view Africa's birds of prey. We spend the day exploring the Hluhluwe-iMfolozi Park, stopping at bird watching hides and elevated view sites in search of raptors soaring the ridges. Accommodation - Hluhluwe-iMfolozi Park - Lodge. Hluhluwe-iMfolozi Park entry fees included. The day begins with an early morning game drive to the northern gate of the Hluhluwe-iMfolozi Park, the Memorial Gate. From there we travel to Lake Jozini where we spend the remainder of the day doing a water safari to see the huge variety of animals and birds along the shore. 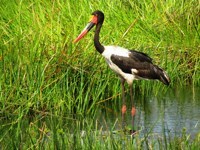 The scenery around Lake Jozini is spectacular and wildlife is abundant. Accommodation - Bush lodge on a private game reserve. After breakfast, we travel to the Mkuze Game reserve to visit a number of water holes and hides. 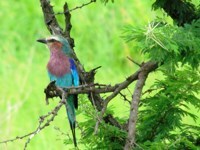 Mkuze is well know for excellent birdwatching and is one of the most popular birding spots for specialist birders. The park has a variety of habitats ranging from wetlands to woodlands and grasslands. From Mkuze Game Reserve we travel to the Muzi Pans where sightings include flamingos, pelicans, Pel's Fishing Owl and Goliath Heron. From the Muzi Pans we travel to the northern section of the St Lucia Wetlands Park (iSimangaliso) where we spend the night in a bush camp on the shores of the Kosi Bay Lake system. We stop in Sodwana Bay for lunch. Accommodation - Bhanga Nek (near Kosi Bay) - Bush Camp. St Lucia Park entry fees included. The day begins with a birding trail along the shores of the Kosi Bay lake system in search of bird species such as the Palmnut vulture, Pink throated Twinspots and Narina Trogon. From Kosi Bay, we travel to the Tembe Elephant Park, home to Africa's largest elephants. We spend time at a hide in Tembe to view the animals and birds coming down to drink. Tembe is not commercialized, all the roads are 4x4 tracks, and only 20 vehicles per day are allowed into Tembe. 4x4 vehicles only. From Tembe we travel back to St Lucia to arrive at your accommodation in the late afternoon. These St Lucia birding package tours are flexible. If you do not have 5 days available, we can change the package so that it fits into your travel schedule. 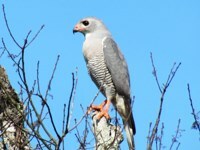 St Lucia Birdwatching | St Lucia Birding | St Lucia Birding Tours | St Lucia Birdwatching Packages | Hluhluwe-iMfolozi Birding | Hluhluwe-iMfolozi bird watching.